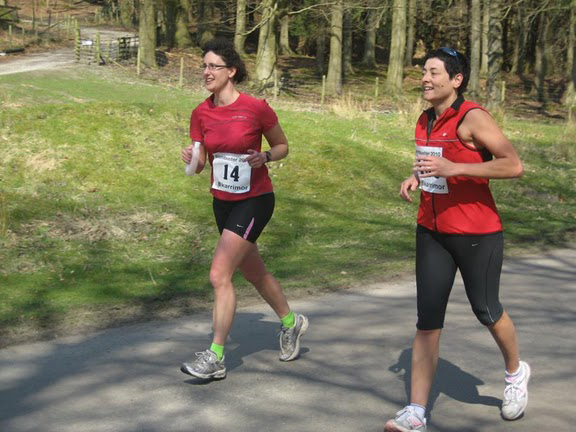 ENTRY FOR THIS YEAR'S DAMBUSTER CHALLENGE TRAIL RACE/FUN RUN/CHALLENGE WALK IS NOW CLOSED. Once entered, we cannot refund the entry fee if you subsequently have to withdraw from the event. If the event is full, please DO NOT email asking for a place, or an entry form. Please do not ask if there are cancellations, and please do not ask us if someone can take your place. There are no substitutes allowed, and there is no waiting list, and when the entry list is full, no more entries can be accepted for any reason. (We're all unpaid volunteers, and we haven't got the resources to handle all that administrative kerfuffle). 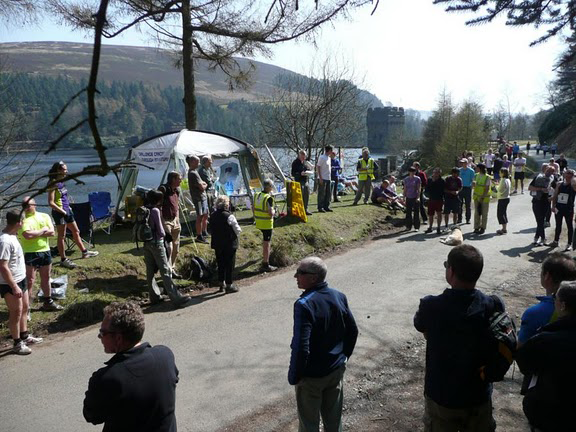 The Derwent Dambuster is a fundraising event for Challenge Cancer Through Adventure. Your entry fees are used to support people undertake adventures which can transform their lives. Please help us to help even more people by getting sponsored to complete the Dambuster event. You can download a sponsorship form here. Please DO NOT contact Challenge Cancer Through Adventure about anything Dambuster related. The Fun Run and the Trail Race start at 10:30 a.m. 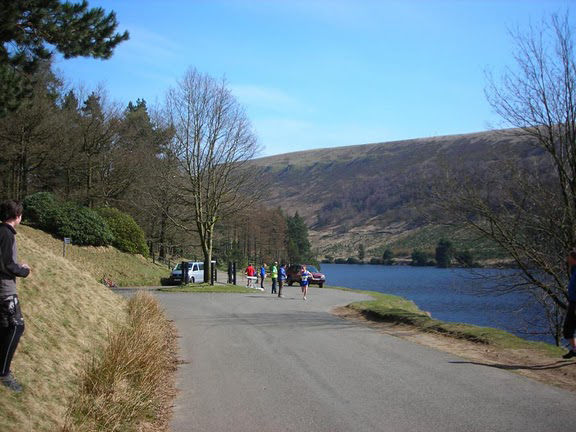 Parking, Registration, Start and Finish are at or near to Fairholmes Visitor Centre in the Upper Derwent Valley, OS Grid reference SK 173894. From the West, take the A57 Snake Pass from Glossop towards Sheffield. At Ladybower Reservoir, turn left for Fairholmes visitor centre. From the East, take the A57 Snake Pass from Sheffield towards Glossop. At Ladybower Reservoir, turn right for Fairholmes visitor centre. 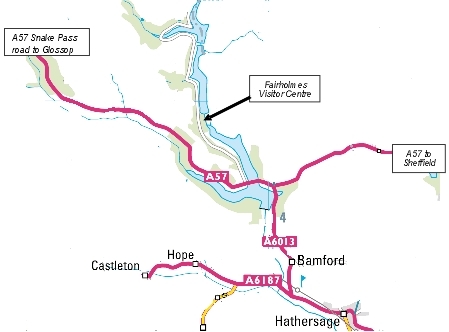 From the South, take the A6187 and then the A6013 from Hathersage through Bamford. At the T junction with the A57 Snake Pass turn left towards Glossop. At Ladybower Reservoir, turn right for Fairholmes visitor centre. From the North, park at Crowden and walk for about 10 miles over Bleaklow! Parking is limited at Fairholmes. Pay and Display Parking is available at Fairholmes Visitor Centre UPPER car park. Please do not park in the Lower Car Park by the Visitor Centre. Free Car Parks are available on the approach road just before the Visitor Centre. Please follow the directions of Event Marshals. DO NOT PARK outside the official car parks. Failure to observe these parking instructions could jeopardise the event's future. This is a very popular visitor area and the car parks will be full before the event starts, so be early. There are toilets at Fairholmes Visitor Centre. There are no changing facilities. The outdoor cafe at Fairholmes usually opens at 8:30 am. Registration will take place at Fairholmes lower car park. All participants MUST report to Registration, to receive final instructions and to collect their numbers. 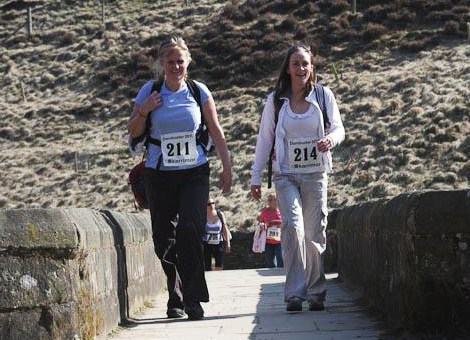 Challenge Walk Registration is between 8.00am and 8.45am. 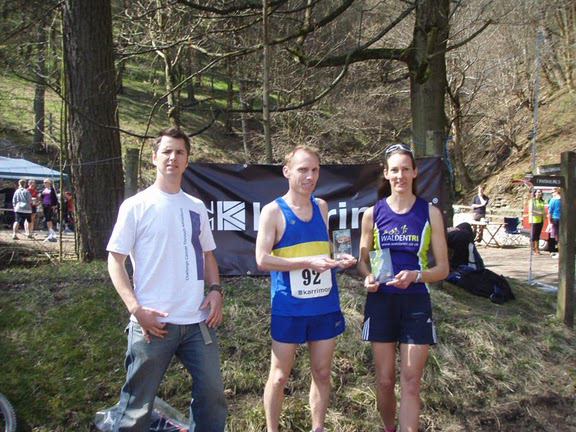 Trail Race and Fun Run registration is between 8.45am and 10.00am. Don't leave registration until the last minute, every year some entrants miss the start as they will still be queueing at registration. At registration you will be given final instructions, your number and safety pins, and your wristband timer. If you are travelling alone you will be able to leave your car keys at Registration. If you have sponsorship money you wish to hand in, this can be done at registration. If you wish to leave clothing or belongings, bags will be available at the Start, (not at Registration), and these will be taken to the finish. The start is about 5mins walk from the car park. (Look for a big dam wall, go to the field beneath it, and you'll see the Start). The Peak Park Authority have asked us to point out that the shoreline supports breeding sandpipers, so please ensure that all dogs are kept on a lead at all times. We may take photographs of the event for publicity purposes. Please advise us if you do NOT want photos of yourself to be used for this purpose. 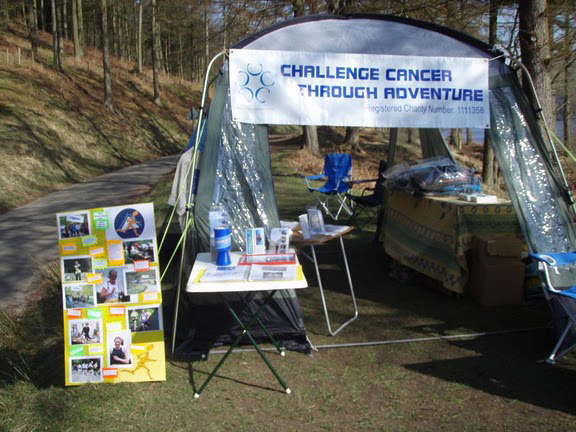 Challenge Walk - There will be a briefing for all walkers at the Start at 8.55am. The start is at 9:00am. Note: If you expect to complete the course in less than two hours, then you are a runner, and you should start at 10:30, as we won't be able to process any finishers until after 11:15 am, and you definitely can't have any cake until 11:30. Trail Race and Fun Run -There will be a briefing for all participants at the start at 10.25am. The start is at 10.30am. The route follows a stony unsurfaced track for the first 6 miles, then a quiet tarmac road for the rest of the course, with a short stretch over a grassy or muddy footpath. There will be signs and marshals, but the course is obvious – do not leave the main track or road except where directed by marshals. 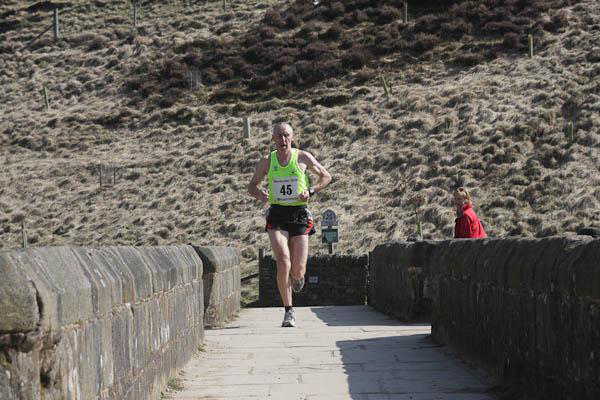 The Start is on the grass below the Derwent Dam wall. The course goes North on an unsurfaced track along the East side of the Derwent and Howden Reservoirs. At the North end of Howden Reservoir, the course turns left onto a footpath to cross the river Derwent at Slippery Stones footbridge. Another short stretch of unsurfaced track leads to a tarmac road at King’s Tree, (water available) which is followed to the Finish just before the Derwent Dam above Fairholmes. The road and track are closed to public traffic, but runners should beware of vehicles, including buses, on the tarmac road, and cyclists on the road and track. Last year, the bus drivers pointed out that some runners who were wearing earphones were oblivious to buses approaching behind them. You won't hear cyclists screaming either, if you are listening to music. In or after wet weather parts of the course can be muddy or slippery and appropriate footwear should be worn. IMPORTANT! 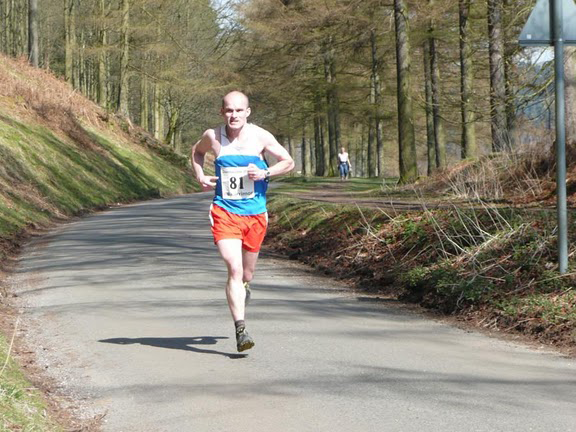 Parts of the course, especially near Slippery Stones, can be very exposed, cold and windy, and runners should be appropriately dressed and equipped for the prevailing weather - you are strongly recommended to wear or carry warm clothes and waterproofs. Water will be available at King’s Tree, about halfway round the course. Free hot and cold drinks and cakes will be available at the Finish. There is also a café at the Visitor Centre, which usually opens at 8:30 am. 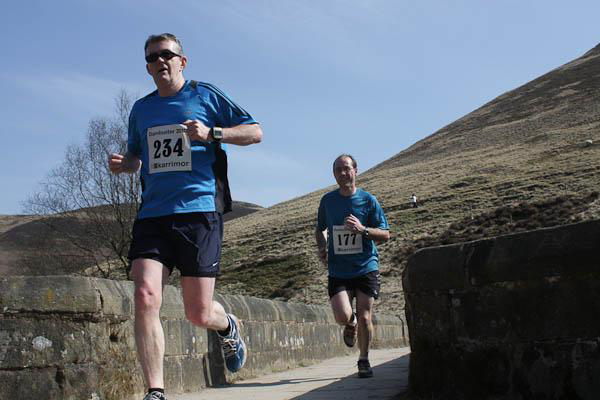 The Finish is about 100 yards northwest of the Derwent Dam wall, about 5 minutes from the Visitor Centre, a little further from the Car Parks. 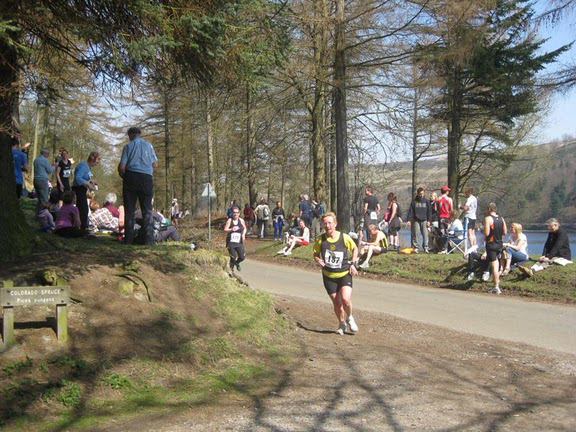 At the Finish you may get hot and cold drinks and cakes will be available. All participants MUST report to the finish, even if they retire. Prizes will be presented to the winners and runners-up in the male and female categories on the day, at the finish, at around 12:15 pm. We may also award spot prizes to anybody we feel like awarding a spot prize to. If you are collecting sponsorship for the event then a big thank you. Sponsorship forms are available on our website. Money raised can be paid in on the day at registration or sent to the address at the foot of this page. Please make cheques payable to Challenge Cancer Through Adventure.